Mezco Toyz 6" Mortal Kombat line comes out swinging! Does Raiden stand up to scrutiny, or is he forever a Blundergod? Check out the review! 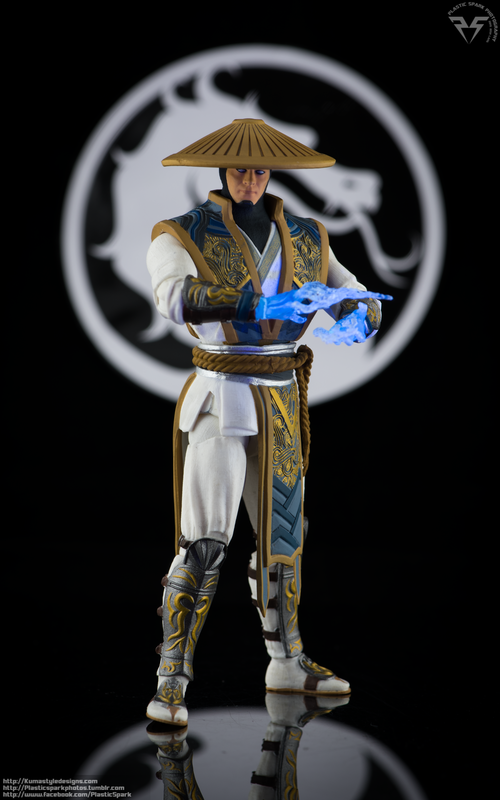 Raiden appears in his main costume design from Mortal Kombat X, the most recent entry in the Mortal Kombat series. 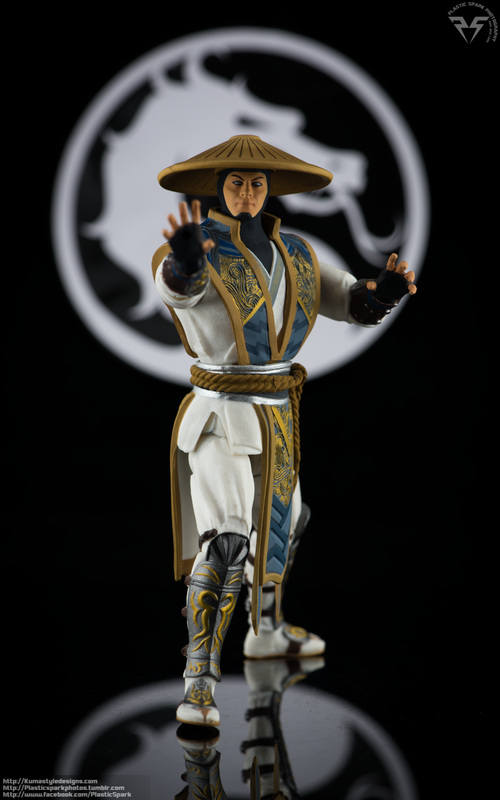 He’s depicted in a white martial arts style outfit with silver bands and a lot of sculpted in detailing and a black under layer including a full head cover. The clothing is sculpted in a way to show folds and some nice creases around the elbows, chest and knees. Raiden also has his Elder God tabard and armor overtop of his white outfit. Last but not least is Raiden’s trademark Bamboo hat. The hat is removable and fits on his head with a nice friction ring on the underside. It is adjustable to a degree allowing for a dramatic pose with the hat hiding his eyes, or to be leaned back a bit to show of the features of his face. You could also tilt it to the side for when Raiden is getting a little sloppy. His head cover including the chin strap is cleanly painted with very little slop and his eyes are mostly white with very light grey irises, a nice touch that can be easily overlooked if you aren’t looking for it. Hands down the physical appearance of this figure is its absolute strong point. 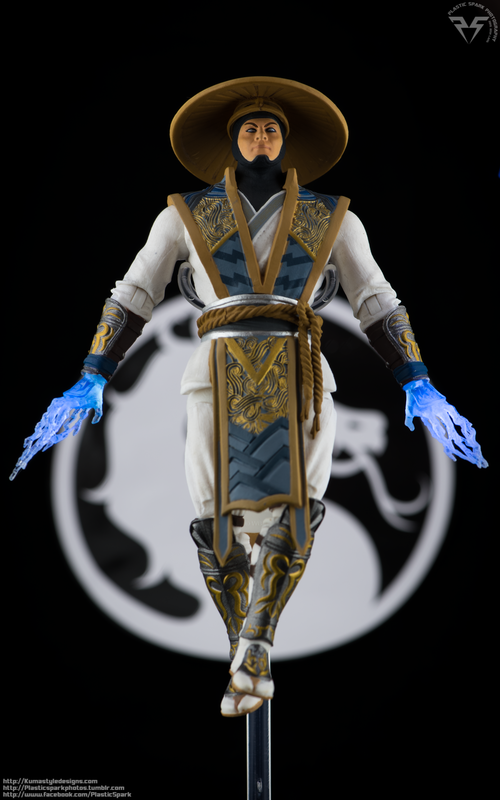 It is a bang on fantastic representation of Raiden from MKX and at a price point of $20 it can’t be beaten. Unfortunately posability is where things go a little downhill. You might notice in some of the photos, he looks a little stiff. Part of this is due to the fact that his legs can only move back and forth about 20 degrees… it’s pretty pathetic. You can’t get him in to any real martial arts ready stances and most of his posability comes from the waist up. His legs can splay out to the side almost the full Van Damme but not quite, though without any forward or backward movement that articulation is almost useless. His ankles rock forward and back and he has a slight ankle tilt as well, though the joints are so stiff they tend to slowly creep back to their original positions if you let them. Raiden’s arms can move out to the side in a T position with little trouble, but no higher due to his tabard. His elbows are single jointed and you can almost get 90 degrees out of them but the fabric sculpting of his clothing gets in the way. The elbows also have a rotation joint in them in place of a bicep swivel. His hands are on pegs that have a back and forth swaying joint but they plug so deep in to the wrists that there is only a slight bit of movement in the wrists. Enough for some diversity in posing so it’s acceptable. His head is on a ball joint and actually has a nice range of movement, but can be blocked left and right by the collar of his robes. One incredibly clever part of the engineering is the ab joint. He has a ball joint in his abdomen and instead of sculpting it under the clothing the seam is actually hidden by his belt allowing for a great turning radius and a bit of side to side and front to back crunch in the midsection. Despite the lack luster performance below the belt, this joint does allow for a bit of dynamic range when posing Raiden. All in all for a $20 figure the posability is acceptable and you can get Raiden in to a number of iconic and menacing poses… just don’t expect the articulation suite of a Figma or Figuarts figure at this price point. Raiden comes with 3 total sets of hands. 1 Set of curled, battle ready hands that are useful for combat poses and dramatic stances. 1 Set of splayed flat hands, good for a more relaxed pose or to… I dunno pretend to be John Cena I guess. They are a bit awkward depending on how you pose them as they seem almost too rigid to be relaxed. He also comes with a set of Lightning effect hands cast in a clear blue plastic with lighting shooting from his fingertips. These hands look fantastic but unfortunately the joints and connectors are also made of clear plastic which is known to be brittle. I actually broke the clip on one of the hands while taking these photos. I was able to repair it enough to continue use but do be careful installing and removing the effect hands. I might advise not to actually click them in all the way as they can be quite tough to remove and put a lot of stress on the plastic. Raiden also comes with a small ball of sparking electric energy. The ball has a peg on it and can be clipped in to the palm of one of his gripping hands. The lightning ball is nicely details and is translucent and can be lit up. I also found the clear blue effect parts to be reactive to uv light and I was able to make them glow using a small UV penlite in the photos. 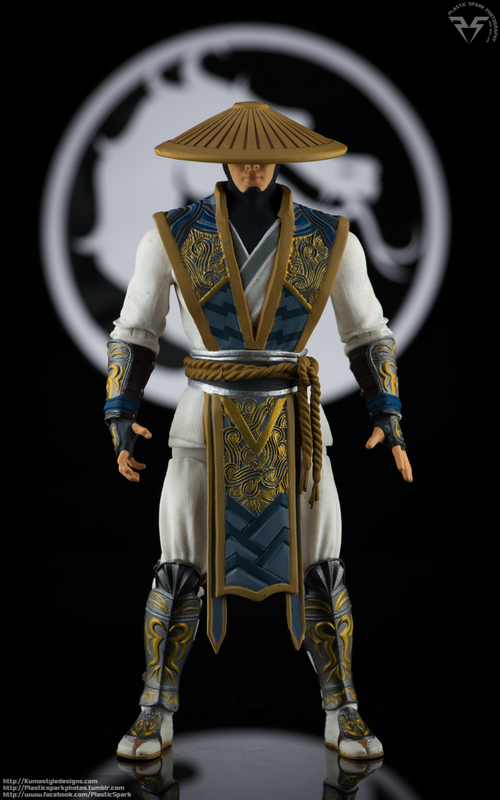 Since it is removable, I would also consider Raiden’s hat to be an included accessory. It can be rested on his gripping hand, though none of his hands can truly hold it. Unfortunately it cannot be mounted on his back in any way without modification. The hat would most likely fit other figures in this sort of scale (Marvel Legends, DC Collectibles) and I do intend to mess around with it a bit in the future. If you want a decent figure of Raiden from Mortal Kombat you can’t go wrong with this guy for $20. That being said I certainly wouldn’t pay any sort of aftermarket inflated price unless you are a diehard fan and just have to have him. From what I know these figures are currently discontinued (at least in Canada, at EB games where I have seen them) but there is a wave 2 in development. Scorpion and Sub Zero are included in wave 1 but I have not been able to track either one down. If I can find them in the future I’ll certainly give them the review treatment as well. Check out the gallery below and let me know your thoughts in the comments!